Do Meerkat and Periscope Apps Commit Copyright Infringement? Did live streaming app providers like Periscope and Meerkat infringe on copyright law when each streamed this past week’s Floyd Mayweather and Manny Pacquiao live boxing event? Does the answer change if the event is not live, but say perhaps an originally scripted television show? These were the questions I received this week as everyone nursed their wounds from the fight that was or rather wasn’t. Periscope and Meerkat are live video streaming services used through smart phones. The apps allow users to stream live video of whatever the user decides to film. They are the film equivalent to Instagram’s still photography app in real time. The short answer to whether the apps infringe copyright – yes, perhaps. These new apps have the ability to infringe upon copyright law depending upon how users choose to utilize them because they can display creative content, much like YouTube’s functionality has the ability to infringe upon copyrights held in music. Both live events and scripted television shows are afforded the same protections under copyright law. For a song, television show, or even a fight to receive copyright protection, three items must be present. First, the material in question must be original. Meaning, it cannot be copied from another source. Second, it must exhibit some minimal degree of creativity. The threshold for creativity is small so decisions regarding camera placement and lighting equate to creative expression. Finally, it must be fixed in a tangible medium of expression, like a written document in the case of a story or a song recording on a vinyl record or MP3. The moment the production company hired turned cameras onto the fight ring and began filming, the fight became adequately fixed for copyright protection to be available. Copyright protection is available, even though, the finalized production of the fight has yet to be registered with the U.S. Copyright Office and it is a live event. Some production company received the contract to be the entity hired to film the fight; therefore, to reproduce the fight, even live, without permission would be copyright infringement. The persons who live streamed via the apps of Periscope and Meerkat were infringers because they were receiving the broadcast via pay per view of content not owned by them. But for the streaming apps, the viewers of these live streams would have paid the money to receive the pay per view privileges. Although the apps are responsible for giving the tools for infringement, they are probably not liable unless they fail to honor notice and takedown as outlined in the Digital Millennium Copyright Act. The Digital Millennium Copyright Act (DMCA) allows services like YouTube, Facebook, Twitter, Periscope and Meerkat to limit their liability. The DCMA does this by providing owners of copyrighted content the ability to notify the service of their ownership rights and request the service remove the infringing content. So long as the service takes down the content once notified, then their service can continue. For more on notice and takedown under the DMCA, be sure to read my earlier post titled Does Notice and Takedown for Copyrighted Material Work? News articles about the streaming show the apps did comply once they notified of the live streams. What about the person who simply purchased a ticket, attended the fight live and decided to stream via those apps? Is the in-the-audience attendee liable for copyright infringement? In this case, the issue is not one of copyright law, but rather one of contract law. Go home and read the tiny print on the ticket stub for the last concert event you attended. I feel confident in saying the tiny print on the ticket will have language letting you know that by earning the privilege to attend the event, you are agreeing to abstain from certain activities, such as filming. 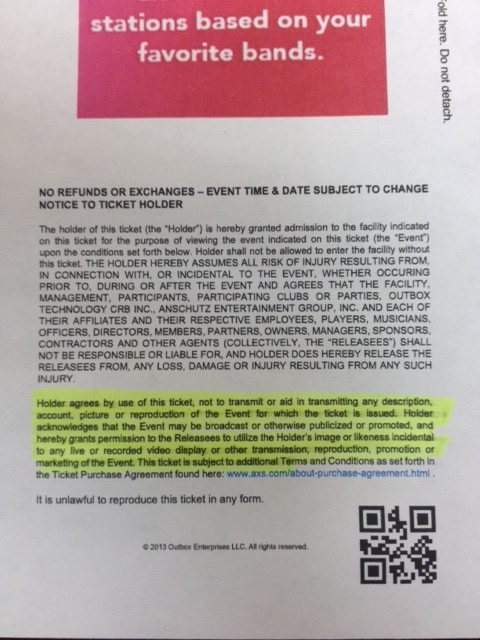 The person sitting in the arena filming is not infringing on copyright but rather is in breach of contract because they agreed to not do so when they purchased the ticket. The concert goer not only gave up money to attend, but also certain freedoms, even unknowingly. Here is a copy of my most recent concert ticket stub. The language I highlighted shows exactly what you give up when you attend a concert. I would find it shocking if the fight this last weekend did not have similar language on the tickets issued for the event. The takeaway is this – if others are paying for the right to view an event, television show, movie, concert or fight, then you probably cannot reproduce the material for free or for profit without infringing on someone else’s work. They have the exclusive rights. Like my dad and mom taught me as a young child, you have to ask and receive permission before playing with a toy that does not belong to you. Do you think those app services should do more to prevent intellectual property from being shared? Take part in the Comments section below and Stay Tuned In! Thank you for sharing this. I was wondering — what if we are playing copyrighted music in the background of a scope? « What is the Difference between ® and TM used on a logo?